YA-2343 shown with one optional shelf. Designed to house your entire system, this functional workstation features a computer-friendly open wire construction. 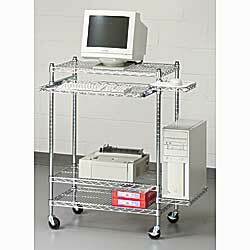 Wire shelves permit cooling air flow and will not collect dust and dirt like solid shelves. Includes 9"W x 18"D tower CPU shelf, 9-1/2"W x 9-1/2"D swing-out mouse shelf with mouse pad, and pull-out keyboard tray. Shelves adjust in 1" increments. Rolls on 3" x 1" hard floor swivel casters, 2 with brakes. Ships unassembled. Color: chrome. IN STOCK. YA-2343 Wt. 43 lbs. 29-1/2"W x 18"D x 42"H.
YA-2344 Wt. 43 lbs. 29-1/2"W x 18"D x 32"H.
YA-2345 Wt. 8 lbs. 29-1/2"W x 18"D.